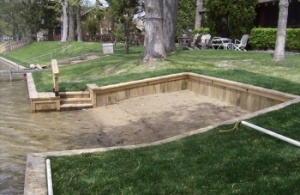 American Marine SC is a leading Michigan marine construction and supply company in White Lake. As a leading Michigan seawall construction contractor for 25 plus years we know how to get the job done right and on-time. Come visit our showroom/on-site estimates available. Contact us today for all your dock, hoist, or seawall construction needs in Michigan. 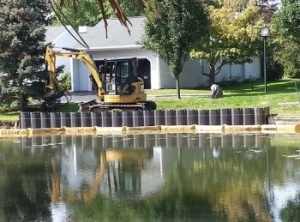 Michigan Seawall Construction Contractor: Specializing in steel seawalls, galvanized steel seawalls, boulder seawalls, wood seawalls, vinyl seawalls, private spillways, rip rap seawall construction, core log bio-engineering and more. Steel seawalls have a long service life and help protect against erosion and shoreline destruction. There is no maintenance required. A steel seawall is extremely durable, and is one of the best options when a heavy duty wall is required. Galvanized steel seawalls are built into the ground surrounding your shoreline and provide maximum protection against erosion and shoreline destruction. Galvanized steel seawalls require no maintenance, and also provides a very long service life. 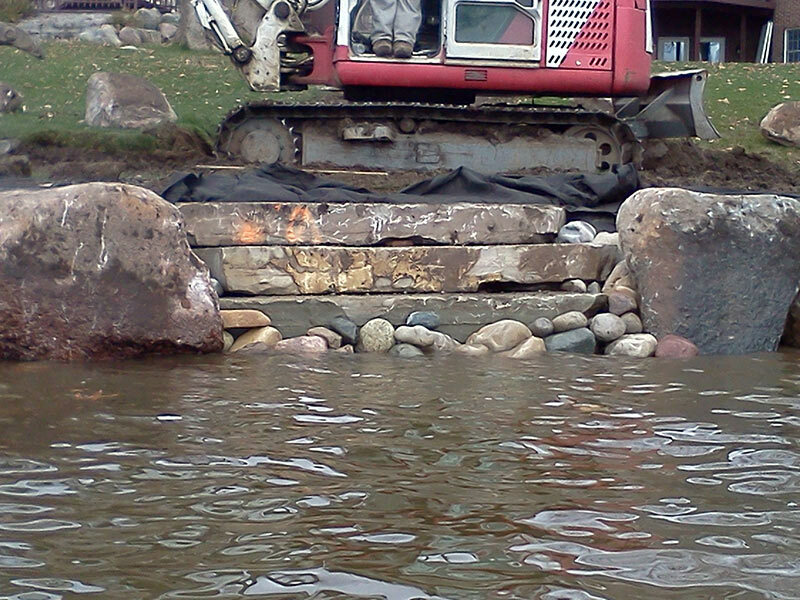 Boulder seawalls create a tranquil and natural look while protecting your shoreline from damaging waves. 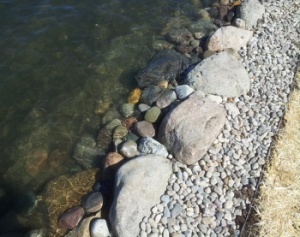 Boulder seawalls are built over a filter fabric and each boulder is carefully selected and placed to insure maximum protection. Chosen for its aesthetic appeal and relatively low material costs. Wood seawalls are designed to give you adequate erosion protection with relatively low maintenance. A filter fabric will be installed behind the wall to prevent any backfill from filtering through the wall. 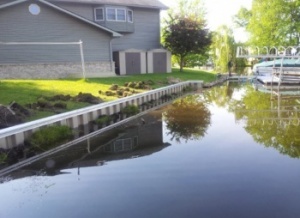 Vinyl seawalls are designed for lower ice pressure areas. Chosen for its aesthetics and nature of the material, vinyl seawalls do not rust, crack or rot. Vinyl wall has a variety of cap options: wood, composite and aluminum. 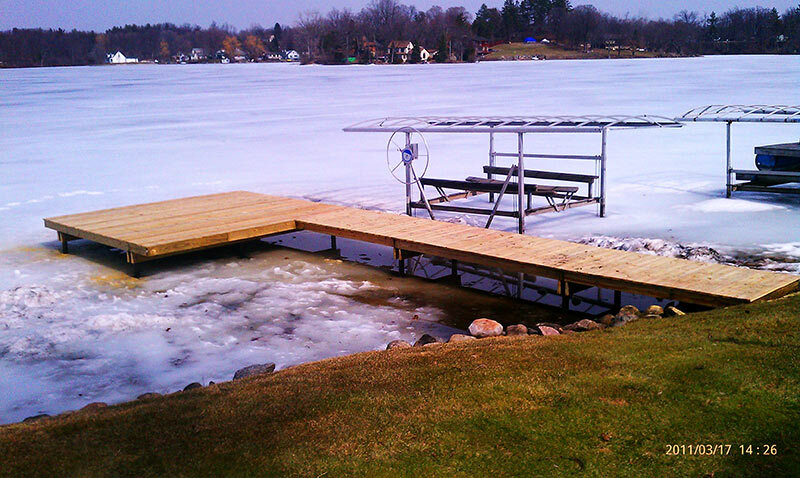 Michigan Dock Construction: Specializing in boardwalk construction, floating docks, permanent docks, Hewitt Roll-a-dock, suspension piers, vinyl, wood & aluminum docks and much more. Michigan Boat Hoist Sales & Installation: Shore stations, Hewitt hoists, PWC hoists, and more. Local service areas: Oakland, Macomb, Livingston, Washtenaw, Wayne & Genesee Counties. Please call 248-887-7855 for extended service areas. 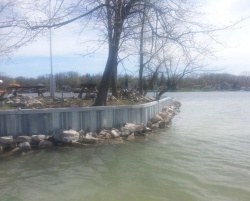 American Marine SC…your leading Michigan Seawall Construction Contractor. Call today!